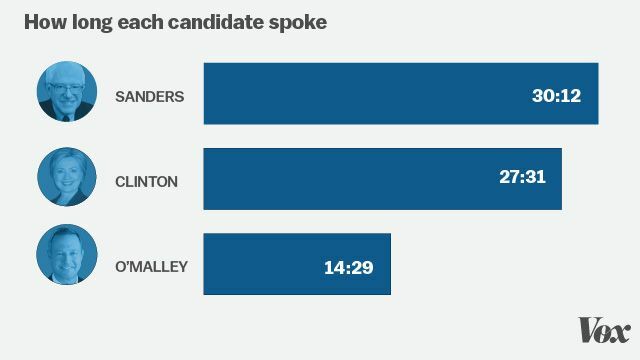 Bernie Sanders dominated the fourth Democratic debate on Sunday night — and the speaking time shows it. Former Maryland Gov. Martin O’Malley came in a distant third, which isn’t likely to help a candidate who began his remarks Sunday night by reminding the audience of his name. Sanders’ increased speaking time came as he’s climbing in the polls and appearing to pose a real threat to Clinton in the Iowa caucuses. Viewers who missed the past three Democratic debates and who tuned in for the first time saw in Sanders a sharper, more detailed, still combative candidate — and one who was getting a lot of airtime.